Café & dining • Kiosk • Souvenir shop • Historic Exhibition • Hydropower Control Room • Art • Capacity, 150 guests. Wifi available. Opening hours 2019: every weekend from saturday 18th may to sunday 29th september. every day from saturday 8th june to sunday 1st september, from 11:00 – 19:00. 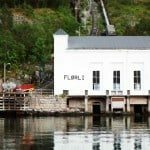 The historic hydropower hall from 1916 is a must-see in Flørli. In the large turbine hall, you can see an original turbine and visit the control room. The exhibition tells the tale of this feat of engineering, through pictures, artifacts and video. In the hydropower hall is also the Power Café. An intimate, original café in the refurbished entry to the hall. The café serves coffee and cakes, waffles, lunch plates and a couple of traditional Norwegian warm meals, download menu here (see also our food for groups). There is also a Kiosk with basic necessities and a little Souvenir Shop. See pictures from the café below. Pub – all rights • Meeting Room • Patio with grills • Capacity, 50 guests. Wifi available. Opening hours 2019: every day in july except sundays and mondays + every saturday in may, june, august and september, from 20:00 – 23:00. Openings times may be altered if the pub is reserved for group bookings or when there are special events. See calendar for details. We’ve recently refurbished the old red school near the quay. It had two classrooms, that now have partly been joined. There is a bar and kitchen corner, from where we serve ham&cheese toasts and other bar snacks as well as coffee and alcoholic beverages. We’ve tried to preserve the intimate school atmosphere with decorative school signs, wall-maps and benches. For groups, there are basic facilities and a projector to hold meetings. Outside the School-pub is a little patio with grill-tripods as well as a large sitting corner under canvas. See pictures from the School-pub and patio below.